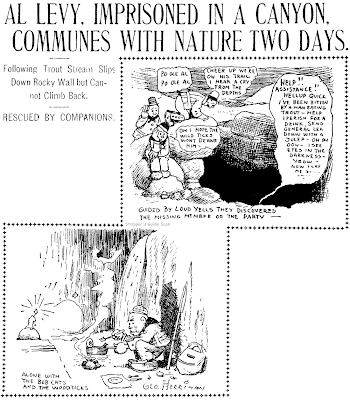 Sunday, September 1 1907 — The accompanying story tells the saga of Al Levy, who in his quest to locate the ultimate fishing hole, got himself stuck in a box canyon outside of Seven Oaks California. To enter a promising V-shaped canyon he had to slide down a giant boulder. After a day of what did turn out to be excellent fishing he found that it was impossible to climb the boulder to exit the canyon. Luckily he had friends who knew his general vicinity and came to search when he didn’t return. Levy had to spend an extra day in his prison, though, while the friends went to town to fetch ropes to help extricate him from his predicament. Sunday, September 1 1907 — Got a little egg on my face; I was scouting around the net to gather a little more intelligence on the Gans-Britt match today. You may recall that I’ve been claiming all along that the fight never came about. Well, that’s what the website I usually use for boxing info said, or at least that’s how I interpreted it. Today, though, I found a New York Times report on the fight, describing a match that did indeed come off. Oops! Guess I don’t have any boxing historians in the audience to keep me honest. Just goes to show you should take everything on the web with a grain of salt. Maybe a teaspoon’s worth in my case. Anyhow, today’s Herriman Britt-Gans cartoon tries very hard to draw some sort of parallel between statehood and Britt’s desire to get a championship fight. In my humble opinion George stretched his analogy beyond the breaking point. Oh, well, they can’t all be gems.